For the first two and a half years of her life, Magnhild Tellefsen lived a happy secure life in the seaside town of Grimstad in Southern Norway. Then the Germans invaded Norway. 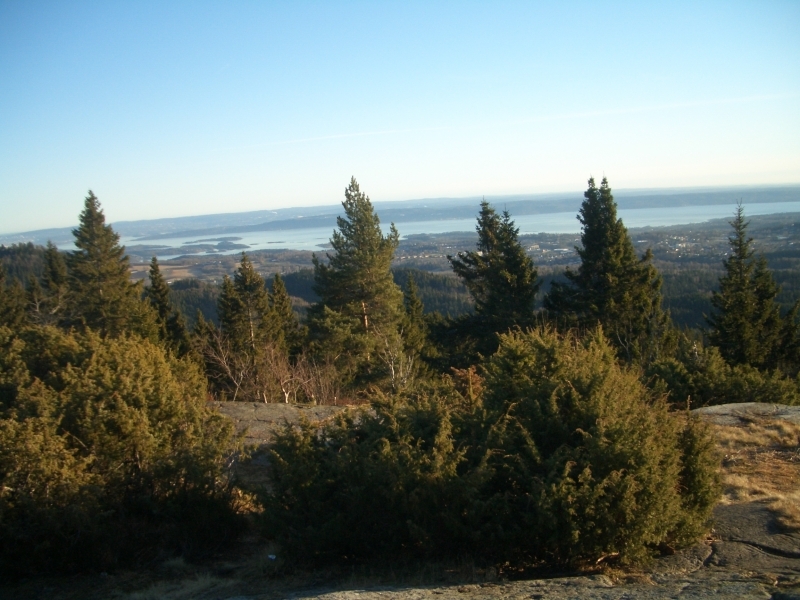 Southern Norway became a hotbed of Norwegian Resistance and life was changed for everybody – and especially for a family whose father became one of the leading members of the Resistance. Magnhild Tellefsen left Norway in 1956, married a Frenchman… had four children and has lived a happy secure life in France ever since. But the memories of her early years in Norway remained etched in her memory and the urge to write them down has finally been realized. In April 1940 my grandmother died and Norway was invaded, two events forever associated in the memory of the two and a half year-old I was. Flowers everywhere, friends and relatives coming to visit, men in uniform and then, suddenly, what is remembered as « panic day »: The rush to the station to get out of Oslo, the throng (a big brute of a man pushing aside women, children and old people, causing indignant exclamations), myself being lifted over people’s heads and safely deposited in the compartment with Mummy and the suitcases. No bomb ever fell on our little town. The population was nevertheless evacuated, and my mother and I were sent to a farm in Lia. Given my age, all I remember is sleeping in an old-fashioned bed with a canopy, while my doll was allotted a carved cradle worthy of a museum! My father, who had taken part in the battle of Fornebu on April 9th, now joined us and started working as an accountant for a local shipping company. About his other activities I, of course, knew nothing at the time. I used to stand on the landing, waiting for him to come home and call from the staircase: « Jump! », catching me in his arms and telling me to look into his pocket, where there always was some little surprise. After all these years, I still cannot help secretly laughing whenever I hear little grey men brag about being too preoccupied with serious matters to waste any thought on such trifles. Every day seemed to bring new changes. For one thing, most of what we were used to eat disappeared from the menu, replaced by more or less strange novelties, and I learned words like “ tickets” and “surrogate”. Once we even ate cormorant, though we never had the courage to use cod-liver oil for frying like some people did, and “stinking up” the whole neighborhood! My father would take me out in the boat to gather seagull’s eggs in the skerries. He taught me how many we could take without the birds noticing. Clothes, too, had become a problem. People wore their old wardrobe until it was threadbare, children grew out of theirs. The shops had little to offer, to say nothing of the quality. My mother made me a skirt of what was supposed to be a woolen fabric. When I tried it on, she gave it a light tug to see how it fitted and there she stood with half the skirt in her hands! Garments were turned and recycled, sweaters undone and re-knitted, sheets dyed and made into summer dresses and blouses. Shoes were another source of worry for parents with growing children. Mr Jensen, our shoemaker, did miracles, but even he could not make leather! An old pair of rubber boots became a treasure in winter. In summer we clattered about in “trebånner”. These were wooden soles with straps of pleated paper fastened with nails. The nails kept popping out of their holes, making our ankles bleed and our mothers run for iodine and plaster when we came home. Even buttons were hard to find, and I remember a dignified old lady lowering her voice to tell my mother she had to use safety pins. “Imagine, Mrs. Tellefsen, safety pins!” – utter disgrace not long ago. Disgrace or not, I was grateful for the one a playmate lent me once when my suspender snapped and my stocking fell down: “Don’t worry, I’ve a lot of them”, she said, lifting her skirt to prove it! I brought it back the next day as carefully as if it had been made of gold. There were people we had ceased seeing or even saying “hello” to – they were “striped” 2 , said the grownups – and shops we no longer entered. One morning my mother was buying vegetables at the market, when she all of a sudden seized her basket with one hand and me with the other and darted off with such a furious look that I thought I had done something terribly wrong, until I heard her exclaim: ”New order – I’ll give him new order!” It was the last time we bought vegetables from that man. We children, who had been told not to tell lies because it was a sin, now learned that certain people should not be told the truth because it was dangerous. With the adaptability of our age we soon understood the difference, and I don’t think we grew up to be hardened liars for all that! Another novelty was the blackout: No more streetlights, blinds at the windows, electric torches in our pockets and fluorescent pins to wear in the dark. Not that we went out much in the evening. Everything was “verboten” (another new word), except for prayer meetings, always a tradition in the South, which now multiplied. It is true that there were reasons enough to pray. The Salvation Army was highly popular, singing, and playing in the market place on summer afternoons to a receptive populace. Unlike the German band that sometimes turned up to play military music to a rapidly disappearing audience. With the singing of the soldiers marching through the streets, we had quite enough musical entertainment of that kind. “Good gracious”, said my grandfather after a furtive glance through the window-pane (to open and listen being, needless to say, out of question), “they are gaping so you can see what they had for lunch!” “Haïli-haïlo” and other “classics” became so familiar that I sometimes joked about knowing them as well as if I had been in the Hitler Youth myself. A single soldier was an uncommon sight. Once, however, we saw one walking down the street as we were sitting outside our house husking peas. When my mother went to fetch something in the kitchen, he stopped and asked me in broken Norwegian: “Is she your sister?” Leaving my peas and my bowl, I ran in as fast as I could. “The cheek”, said my mother, not in the least flattered to have been taken for a young girl! I must have been about five when a new “uncle” appeared, literally “out of the blue” – parachuted from England, as I was to learn later. His name was supposed to be Andersen, a distant cousin of my father, and we became great friends. 3 (Once we even sneaked out to pick strawberries in secret!) I can still see him at dinner swallowing the eyes of the fish we were eating, just to see my horrified face. One day I decided to surprise him with a special treat of my own making. I don’t remember what went into the mixture I heated on the stove (without my mother’s knowing), but the fact that he ate it is certainly one of the most heroic things he did! Then he was gone, as suddenly as he had come. I heard later that he never got caught, though he once had a narrow escape and was shot in the leg. I think he worked for the Red Cross after the war. By now things had taken such a turn that even children felt there was danger in the air. Every day there were more rumours and more bad news. My father had already been arrested once, but somehow managed talk his interrogators around, thanks partly to his sang-froid and presence of mind, partly to lack of proof. Realizing it was only a question of time, my parents thought of fleeing to England. I remember going with my mother to Arendal to meet a man on board a boat who was to take us there. The plan was dropped when they learned that my grandfather might be taken as a hostage. Then my father was arrested again, and this time the Gestapo knew everything. Somebody had “talked” – we never knew who. My mother said it was better so: “If he gave in to torture, who are we to judge, and if he deliberately betrayed them, he may have a family – imagine having to live with that!” We know nothing of his time in the iniquitous “Arkivet”. Our house was searched by a couple of Germans we had never seen before, accompanied by an acolyte we easily recognized: A local laughingstock who used to trot behind the soldiers when they were out marching (alone or flanked by one or two drunkards or half wits), sneering “guttersnipes” to us as we mimicked him from the sidewalk. Now he strutted about, proud as a peacock, glorying in his new dignity. I had been sent to bed when the door suddenly opened, and there stood the fat, ridiculous little man poking his nose into my room. I shut my eyes as hard as I could and pretended to be fast asleep. “If anyone had told me this individual would ever set his feet in my house”, my mother said afterwards, “I wouldn’t have believed it!” But of course we were not the only ones to whom it happened, nor was he the only one of his sort to have the time of his life in those days. When my mother told me we were to be evacuated again, I first wondered why nobody else was going, but now I was older and knew better than to ask questions. As I learnt later, it was Milorg 4 who organized our stay in Kverve, a hamlet north of Arendal, between a dark wood and a treacherous bog. The first thing I remember from our arrival, after a long and complicated journey by train, bus and buggy, is a huge glass of milk – whole milk – not to mention the butter, eggs, bacon and other half-forgotten luxuries. The farmers, Anna and Anders Søysdal, introduced us to the horses, the cows (I still remember some of their names! ), the chickens, the dog, and the cats. Karin, Aage and Finn, who lived on the nearest farms were my age, they showed me how to build dams on the brook and climb the beams in the barn for thrilling jumps into the hay. The weather was warm and sunny, so I happily “forgot” my much hated “paper shoes” and ran about barefooted most of the time. When I was not outside, I liked to sit in the vast kitchen, listening to the old songs in dialect Anna used to sing while baking, weaving, or churning. She even taught me to churn myself and I nearly burst with pride eating “my own” butter on freshly made “flatbrød”(flat-bread). I shall never forget the farm “in the middle of nowhere” and the kind, warmhearted, open-minded people who lived there. In Grimstad, the atmosphere was heavier and the news more disquieting than ever – no matter how much the grownups tried to keep certain details to themselves in the presence of children. From the “Arkive” 5 in Kristiansand, (Its reputation was known to everybody by now), my father and his companions had been sent to Grini, 6 the German prison camp outside of Oslo. Visits to Grini were rare and only a few letters got through – most were simply intercepted and returned. (I learnt a new German word: “Zurück”, stamped in red letters on our envelope). When I think of Grini, I see the checkpoint at the entrance, the barracks, the narrow room where we waited for the prisoners to be brought in and, last but not least, the warden whose task it was to supervise the visit. In fact, he turned around as soon as the officer in command had left and stood by the door, supervising the outside surroundings instead. Hurried, low-voiced conversations immediately followed, scraps of paper, minutely folded, changed hands and disappeared into trouser legs and shoes until the time was almost up and the warden, seeing the officer was on his way back, whispered: “Er kommt! Er kommt!” before he returned to his place, his face looking as stern and implacable as ours looked innocent. Throughout the years, I’ve often thought of that ”unsung hero”, wondering who he was, what became of him and if he had children: I would have liked to meet them. From this period I have memories of mysterious trips by bus or train (once even in a cattle wagon! ), sometimes carrying skis we hardly used, to unknown places where my mother had “people to visit”. When she could not take me along, I slept here and there with friends and relatives. I was returning home one evening, clutching a big paper bag full of gooseberries from the garden, when the bus was stopped by a group of Germans They seemed very nervous and all but threw the passengers out – “Schnell!Schnell!” – so I stumbled and landed in the ditch, my precious gooseberries scattered all around and my fellow passengers grumbling: ”Fie!” and “Shame!” Whatever the Germans were looking for, they did not find it: A consolation for the loss of my modest treasure! “When the war is over…” We had been repeating it for years, and I do not believe anybody doubted, but how long it seemed! At first we also said: “When Daddy comes home…”, but now we began to realize there was little or no hope, though it was never said aloud. When my Grandfather died, I heard some people say it was a blessing. A year earlier I would have thought it a terrible thing to say but now I understood what they meant. The day came when we learnt that my father and his companions had been sentenced to death. I can still hear my mother’s words, so characteristic of her: “We must think of those whose turn will come when all this is over, their families are the ones to be pitied”. In my memory I still see the prisoners, very calm and upright. The last thing I remember is A. Bjørge’s loud: ”So long!” in English as we left. They were shot at Trandum on May 10th 1944. Time went by, so slowly that it sometimes seemed to have stopped. A man – a Norwegian – if I may call him so, came to our house “for the inventory”, as he said, informing us that “everything we had” (those were his words), was to be confiscated. We never saw him again, and our belongings stayed where they were. Too late, I suppose. For the invaders and their lackeys a “happy ending” was becoming more and more uncertain and the “authorities” probably had more important concerns. Some of the things that figured on the list are still in my possession. I sometimes wonder where they would be now if it had not been for lack of time. In August 1944 I entered primary school, held in the local “prayer house”, our “real” school having been requisitioned by the Germans. Every morning we got cod-liver oil, a matter of religion in our part of the world, soup was served at noon and sometimes we received parcels from the Swedish or Danish Red Cross. Christmas came and went, everybody hoping the New Year would bring the news we had been waiting for so long. In spring, rumors started spreading again. Several times we children ran out with our little flags, carefully hidden till then, and were sent home by the police. Dropping his flag, a little boy burst into tears: “So it’s still war, then?” (I did not see him myself, I only heard a giggling woman describe the scene to my mother, imitating his expression and voice.) My mother did not giggle, she said: “Poor little chap.” Familiar as she was with southern humour, this time the joke was lost on her. I came back from school one afternoon and my mother told me the war was over, I put down my satchel and said, “blasée”: “I’m sure it isn’t true.” But this time it was. 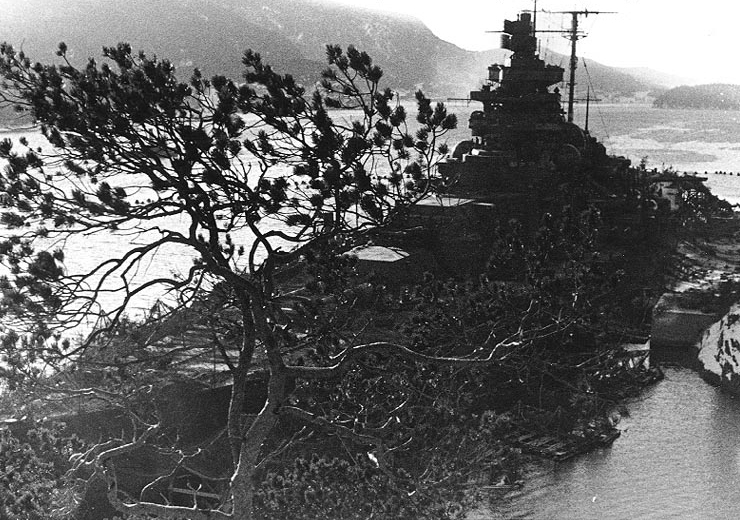 As long as I live I’ll remember the day the Germans left Grimstad. On each side of the road people stood watching in silence: Not a word, not a cry was heard till the last truck disappeared, the soldiers sitting in the back looking dazed and downcast. In the evening, everybody went down to the harbour to celebrate. Someone came running with a box of flares left by the Germans, who certainly never thought their flares would be used as fireworks to celebrate their defeat. Our town began to look its old self again. No more “orts kommandantur”, no more “Bekanntmachnugen”, no more “achtung” and “verboten”. How wonderful it felt! 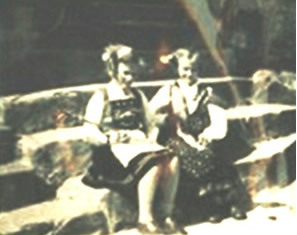 From the 17th of May 45 I have a photograph of a little neighbour girl and myself sitting on the stairs in the sun, proudly wearing our national costumes, now perfectly legal for the first time in five years. (The last time I had worn it was for another photograph, taken by my father in secret behind the house). On Midsummer Day there was great excitement in the harbour. Nobody wanted to miss the traditional bonfire in the skerries – the first one since 1939 – and it proved equal to our expectations. A pair of German uniform beeches hung from a pole in the middle of the wood-pile. Cheers and applause rang out when they caught fire. People were singing, some played the guitar or the accordion: “just like before”, said those who remembered. We children were sitting by the water when a young girl called us: “Here, kids, this is for you!” Wide-eyed, we discovered a large piece of old-fashioned cream-cake with strawberries and whipped cream. Whipped cream…a faint memory to most of us, the little ones hardly knew what it was. The station was overcrowded when the prisoners came back from the concentration camps. It was a moment of joy and solemnity, almost everybody knowing at least one of them, as well as those who were missing. 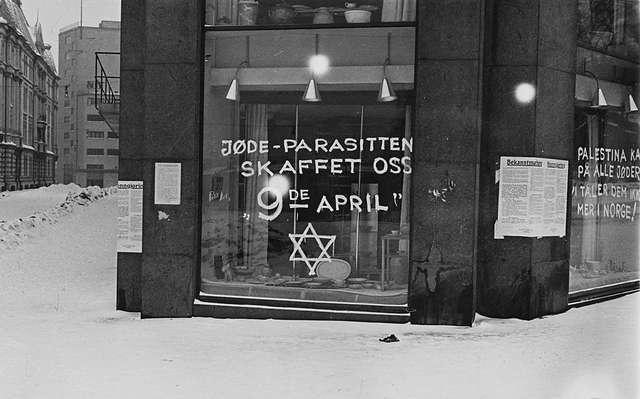 In 1947 we moved to Oslo. My mother received an official invitation to the unveiling of the war monument by the Crown Prince, in the presence of many local notabilities. The mention of certain names made her start: “Already?” 7 She wrote a short reply, explaining that she was not coming – and why. I admired her more than ever. 1. “Guns instead of butter” – one of Goering’s slogans during his Four Year Plan. 2. Striped – collaborators and members of NS. 3. “Andersen” was “Arne Andersen” the alias of Erling Jensen who parachuted into Norway together with Tor Hugo van der Hagen in Operation Cockerel. They were to be weapon instructors for the Norwegian Resistance Movement in East and West Agder. 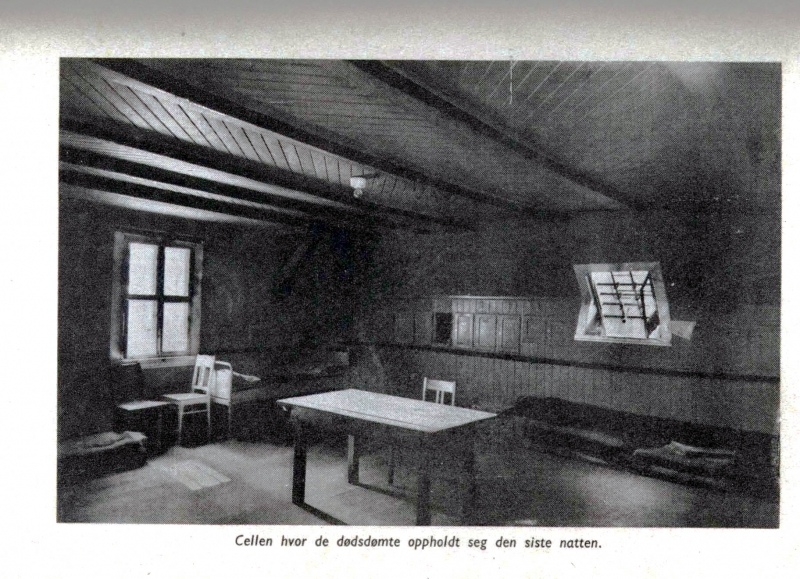 Part of one of the courses was held in Tellefsen’s house in Grimstad. Erling Jensen became one of the three editors of the two volume history of “Kompagni Linge” – Gyldendal Norsk Forlag 1949. 4. Milorg – The military organization of the Norwegian Resistance. 5. Arkivet – The headquarters of the Gestapo in Kristiansand, known as The Tower of Torture. Now a study centre and museum. 7. She claimed that some of those invited to attend had been less than patriotic during the occupation.